The Cooperative Wildlife Research Unit Program began in 1935 when five Units were established at land grant universities. Additional Units have been added in many states since that time. 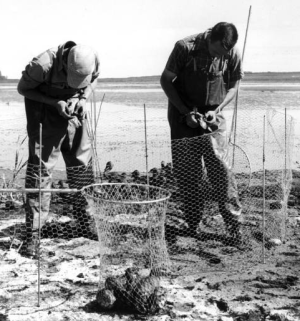 In 1961 the Cooperative Fishery Research Unit Program was initiated. Beginning in 1984, Wildlife and Fishery Units were combined and called Cooperative Fish and Wildlife Research Units. At the present time, there are 40 Cooperative Research Units (see map). The objectives of the Units are essentially unchanged since 1935: (1) conduct research basic to the management of fishery and wildlife resources, (2) educate fishery and wildlife biologists at the graduate level, and (3) provide technical assistance to conservation agencies and groups. The Colorado Cooperative Wildife Research Unit was founded in 1947, and the Colorado Cooperative Fishery Research Unit was established in 1963. The two Units were combined in July 1984. The Colorado Cooperative Fish and Wildlife Research Unit is staffed, supported, and coordinated by Colorado State University, Colorado Parks and Wildlife, U.S. Geological Survey, U.S. Fish and Wildlife Service, and the Wildlife Management Institute.